1. Rinse the lentils; boil in 800ml water for 20 minutes. Drain; set aside. 2. Heat ½ tbsp oil in a large pan; fry the onion for 5-10 minutes, until soft. Add the coriander stalks, garlic and ginger, cook for 2 minutes, then stir in the lentils, coconut milk, lemon zest and 1 tbsp juice; season. Cook for 5 minutes; stir in the spinach until wilted. Set aside; keep warm. 3. Preheat the grill to high. Put the cod on a foil-lined baking sheet and season. Grill for 8-10 minutes; squeeze over the remaining lemon juice. 4. Heat the remaining 1 tbsp oil in a small pan. Add the spices and fry for 1-2 minutes, until fragrant; stir all but a drizzle through the lentils. Serve the cod with the dhal, coriander leaves and any extra spice oil. 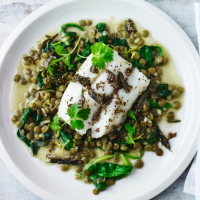 Delicately flavoured, yet almost meaty in texture, cod is rich in protein and low in fat. It’s also a good source of vitamin B12, vital for a healthy nervous system. The humble lentil should be more celebrated. Not only do 3 heaped tbsp count as one of your five-a-day, they're also full of soluble fibre.